Excellent article on the growing trend of ‘personalization’ on CircleUp. For article, click here. 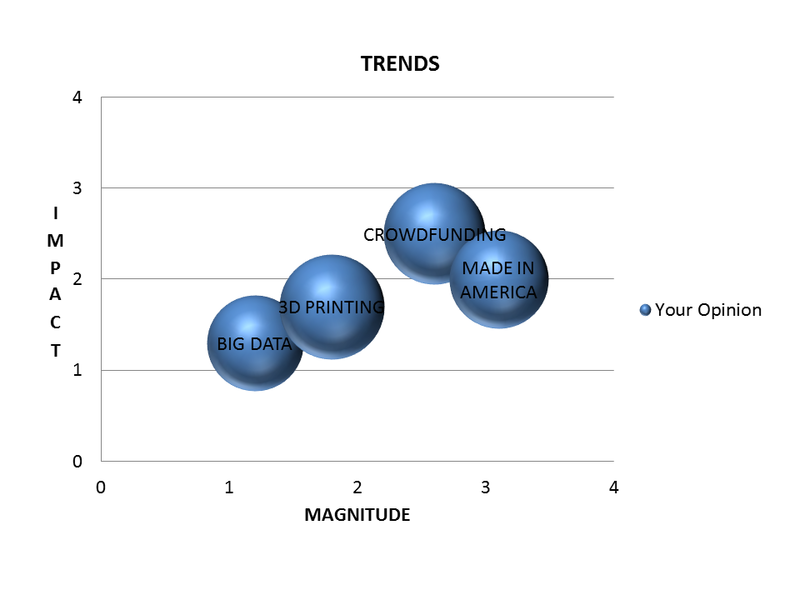 Of these four trends – Big Data, Crowdfunding, 3D Printing, Made-in-America – which will have the biggest impact on business in 2014. Take the poll below. BIG DATA is a big trend. With a multitude of brilliant minds pursuing the field, new innovations emerge daily, but the biggest applications of big data are probably yet to be pondered. Retailers are already using this data to know who you are, or at least what you look like, where you live, what you eat, what you wear, where you go on vacation, how much you spend and get paid a month, who your friends and family are and what you are saying about their products. Plans are underway to use big data to crunch consumer credit worthiness, predict the likelihood of mergers and acquisitions, prevent the spread of disease, combat crime, alleviate traffic congestion and who knows what else. CROWDFUNDING – In 2012, 308 crowdfunding platforms across the world raised $2.7 billion, an 81 percent increase over the amount raised in 2011, according to the annual report released today from the Los Angeles based research firm, Massolution. The growth in 2012 represents an acceleration, up from 64 percent growth in 2011. Looking ahead, growth is expected to reach $5.1 billion raised in 2013, representing an expected 89 percent increase in the dollars raised, the report predicts. A trend is obviously developing. As it exists, the majority of money raised with crowdfunding is still on donation or reward-based platforms, where an entrepreneur or artist raises small sums from a large group of people in exchange for a product sample or experience. Of the $2.7 billion raised in 2012, $1.4 billion was on these platforms, made popular by brands such as Kickstarter or Indiegogo. Lending-based crowdfunding, where campaign leaders have to repay their investors, equaled $1.2 billion. Equity-based crowdfunding, where investors receive a share of the company in exchange for funds, was the smallest sector the market in 2012, totaling only $116 million. Until the SEC issues the regulations to allow the JOBS Act to take effect, private companies in the U.S. are only able to crowdfund from accredited investors. In a handful of other countries, equity-based crowdfunding is already legal. When the JOBS Act takes effect, the distribution of funds raised from equity-based crowdfunding is likely to increase dramatically. This will open early stage companies up to a new, much larger, group of potential investors and it will give unaccredited investors access to a new pool of investments. 3D PRINTING is not a new concept. The platform for it began with a 30-year-old technology called rapid prototyping. Although there were cost-savings benefits to rapid prototyping, the equipment was very large and expensive and had very limited capabilities. Fast-forward to 2013. Hardware and software advancements have modernized rapid prototyping, allowing 3D printing companies to enter the market. Today’s 3D printers provide more accuracy and precision than rapid prototyping because the design of the object is created separately in 3D software. High-end 3D printers now allow multiple materials to be fused together in one print.While the platform for 3D printing is more than 30 years old, today is the first time that 3D printers have become inexpensive enough to be used by enthusiasts and small businesses to create physical objects. It is similar in that sense to the emergence of the personal computer, and we know the sort of impact that had on business productivity and nearly every other aspect of our lives. The real opportunity of 3D printing is that it is giving companies the ability to produce a wide range of objects on demand, with little or no inventory costs. Imagine a ‘virtual’ parts catalog, made up of sets of 3D files that can be printed on demand. Because the inventory is virtual, it would cost very little to offer customers an ever-expanding catalog of products and replacement parts. For a small premium, customers would have the option of creating whatever they want. With the rapid advancement of 3D printing, we are entering an era in which it is possible and economical to produce products at a low volume and with mass customization. 3D printing has the capacity to change the definition of obsolescence, as well as the level of control that customers have over their products. MADE IN AMERICA – This has been a trend in reverse for the past several decades, but it is already starting to change. The labor costs have inevitably crept up in places like China, making U.S. manufacturing more competitive. If you think this trend will be small compared to the others, consider that the other trends listed above, particularly crowdfunding and 3D printing will contribute greatly to the Made in America movement.